Saddle Creek is an old store. It’s 40 feet across, all on one story. As with most stores like this, the most important products live at the front — RIP, POS bar — with the Genius Bar at the rear of the Store, facing out. 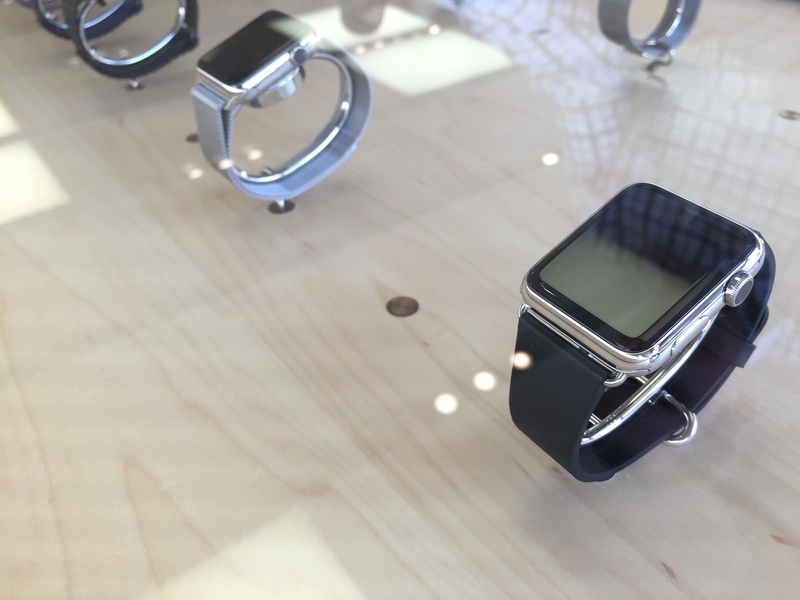 The entire front-left section of the Store was dedicated to Apple Watch. The glass-topped table from Apple’s press events was dead-center at the front, with two tables to the left dedicated to try-on appointments. The try-on tables have drawers built into them, unlocked by badged employees. On top, there are movable acrylic displays. A Watch is mounted on the right, with an iPad mini to its left, displaying more information about what the Watch was doing. Open an app, and info about that app would appear on the iPad instantaneously. 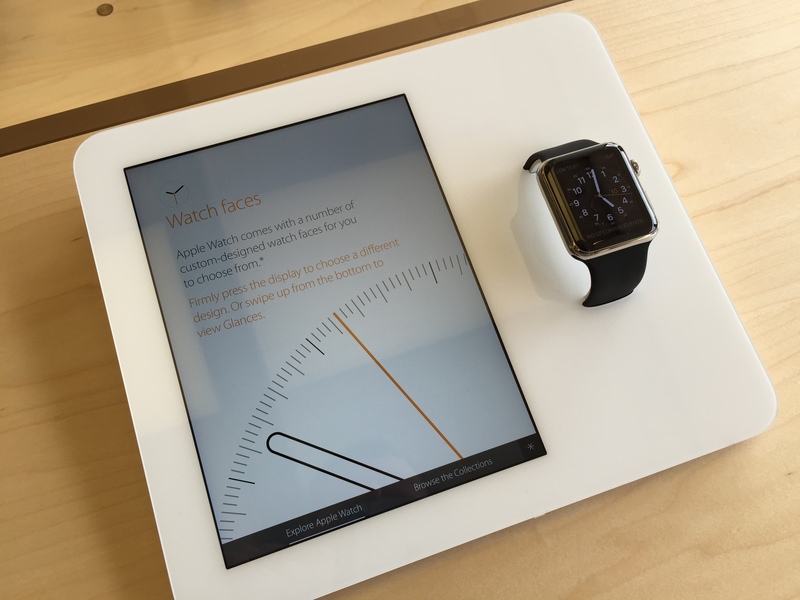 The Watches in these displays were not in demo mode — I could use them as I saw fit. The complaints from reviewers that there is a learning curve rings true. For example, I repeatedly tapped the button below the Digital Crown, expecting to see the homescreen, to be annoyed when the Watch would show its VIP contacts UI. Maybe its years of using an iPhone, but that button just felt like it should take me Home. The Digital Crown feels great. It spins easily, but not freely. It’s precise and effortless, and I’m going to stop before I end up in a white room with Jony Ive. Trying on various Watches was a little weird. The employee with me was incredibly helpful, but had to take the Watch on and off my wrist. As someone who doesn’t like a lot of attention, it was a tad uncomfortable, but it was a great way to try a bunch of different bands. The Milanese Loop is very thin, and the loops are so close to each other that it’s hard to believe it’s not one continuous, flexible surface. It didn’t pull on my arm hair, and the magnetic clasp felt nice and secure. It’s not my personal taste, but I have to say, the smooth, cool feeling left me impressed. I was less impressed with the Leather Loop. It’s very clearly a thin wrapping around a bunch of magnets. It wasn’t uncomfortable, but it wasn’t as soft as I was guessing it would be. The segmented design just doesn’t look good to me. It is the turd of the group, in my opinion. The Classic Buckle is exactly what I thought it would be. Simple, clean and comfortable. I worry about the leather cracking over time, and I’m not a huge fan of the stainless steel being used on the loop at the back, but if I were to buy a non-Sports band, this would be on my list. My Apple Store didn’t have Casey’s beloved Darth Vader Apple Watch available for try-on customers, but I did try a Watch with the $449 Link Bracelet attached to it. While I think the silver Link Bracelet looks a little dated — in a mustache and cigarettes kind of way — it’s perhaps the most impressive Watch band from a hardware perspective. Links can be removed quickly for a better fit and the butterfly mechanism is crazy thin. I was a little surprised that the Apple Store didn’t have a steel Watch on a Sports band, as it seems like a popular combination. While I was a little bummed that I couldn’t try exactly what I pre-ordered, I got to try what I had initially considered ordering — the 42 MM Space Gray Apple Watch Sport with Black Sport Band. The band itself was very comfortable, but tricky to get on and off. I asked and was allowed to take this one off by myself, and it took some finagling. I’m sure it’d be easier with some practice, but this isn’t a band that’s going to come on and off multiple times a day without some annoyance. As to the Watch itself, the Space Gray aluminum looks nice in person. It’s matte and has a the slightest hint of texture to it. In many ways, it reminds me of the dark iPod classic. The Sport weighs next to nothing. My main concern after deciding to purchase the standard steel model was weight. The 42 MM Sport weights 30 grams, while the stainless steel Apple Watch clocks in at 50 grams. In my time today, the weight of the steel Watch was actually nice. The Sport weighs so little it feels a little cheap. While I may regret my choice once I start working out with one on my wrist, for now, I’m happy with my choice. All in all, the try-on appointments are pretty brilliant. I got to spend time with most of the product line, but didn’t feel rushed. I got individual attention, had my questions answered and even got to play with a working Watch, as opposed to just watching a Demo loop. It was the most personalized service I’ve ever seen in an Apple Store, and just what this product requires. While at the Apple Store, I also stopped by the MacBook table, which was shoved way in the back of the store, yielding the primary real-estate to the Watch. Two of each color were out, but I gravitated to the Space Gray model, as I find it very good looking. The screen — as expected — is stunning. It’s bright and rich, like all other Retina displays. What is surprising is just how small and light the machine is. It’s hard to believe something so tiny could pack the punch needed for a Retina display. I didn’t push the machine much, but just bouncing around OS X and some open apps were all just as fast as my MacBook Pro, but I know using a machine like this to edit a podcast or video would be asking for pain. The Force Touch Trackpad is as weird as everyone makes it out to be. I know it didn’t click down, but my brain and finger think otherwise. It’s nutty. 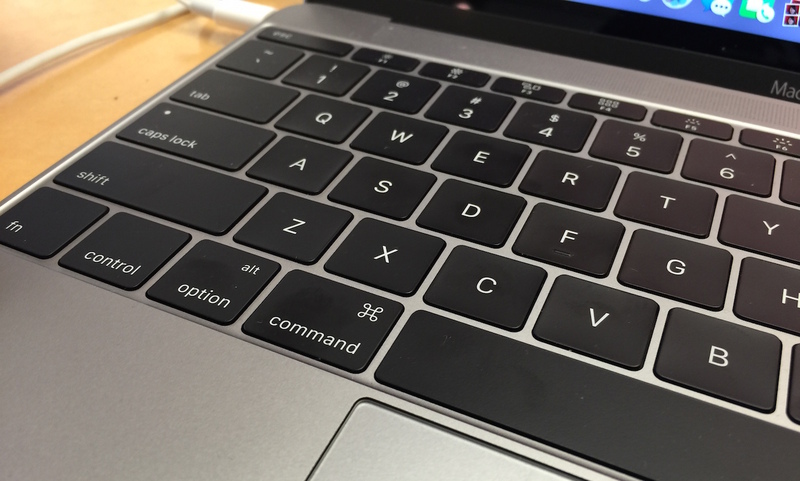 One of the biggest compromises Apple made in designing the MacBook to be as thin and light as possible was to create a new, thinner keyboard. In order to make the keyboard thinner, Apple reduced the amount of key travel—the amount of space that the keys move when you press them. Apple seems to have realize that the reduced travel has made this keyboard less appealing, and has attempted to offset the change with a bunch of other changes that improve the typing experience. There’s a new butterfly key mechanism atop stainless steel dome switches, which Apple says increases key stability, and the keys are all a bit wider than on a traditional keyboard, so there’s more area to hit on each key. After about 10 minutes with it — I typed about half of this section out at the Store — I have to agree with Jason. The big, wide keys are weird, but I can see the appeal for sloppy typists. However, the lack of travel is super off-putting to me. I’m a pretty hard typist. I bang around on my MacBook Pro’s keyboards at a slower rate than Jason’s 115 words per minute, but the words I do get down come out with more force than what’s good for my hands. All in all, the MacBook is the Mac from the future, but here in the present, it has trade-offs. As attractive as an idea it may be, for now, it’s not a Mac I could live with day to day.